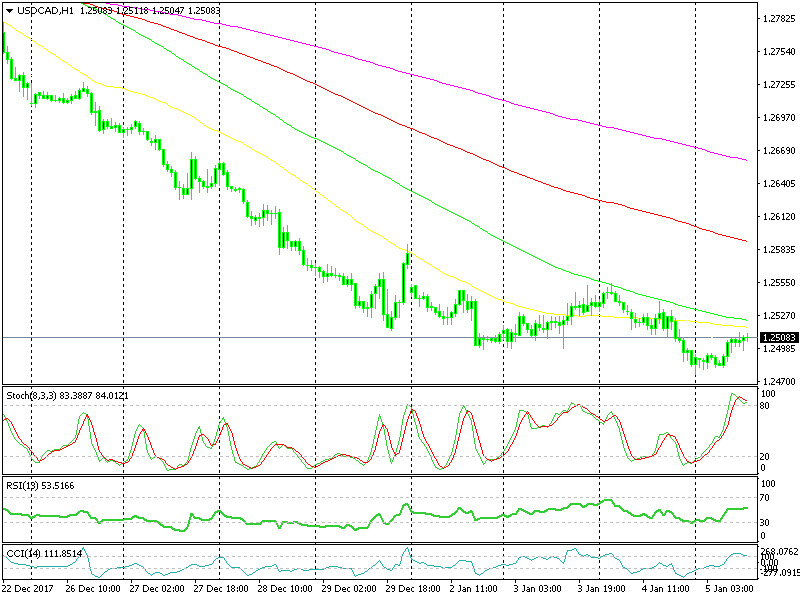 The USD/CAD has been trading on a strong downtrend for the past two weeks. The fundamentals from Canada and the USD selling at year-end have sent this pair on a steep downtrend. Every pullback higher during this time has been a golden opportunity for sellers to jump in on the southbound train. We took one of those opportunities a few days ago. Believing that it couldn’t go wrong, we cashed in on that forex signal. Another opportunity is now presenting itself. The USD/CAD has been retracing during the European morning hours, and it is facing a couple of moving averages on the top side. As it can be seen on the chart above, the 50 SMA (yellow) and the 100 SMA (green) have been providing resistance on top. Every time the price has touched one of them, the pullback has ended and the USD/CAD has reversed back lower. Now, the price is close to those two moving averages, and it seems like the buyers are having second thoughts already. Based on the last few candlesticks, we can see the fear of the buyers. They’re not pushing any higher, and these candlesticks have now closed as dojis. Dojis, as we know, are reversing signals. Furthermore, the stochastic indicator is overbought, meaning that the climb up is over. The stochastic is now heading back down, so it is likely that the downtrend is about to resume. We do have one buy signal in AUD/USD, and the US employment report is soon to come, so the USD/CAD trade can be taken (if you want.) We may or may not open a signal here- only time will tell.